Tanner Schwartz joined the Joffrey Ballet for the Fall 2009 season. Tanner began dancing under the direction of Julie Whittaker and Yvonne Mounsey at Westside School of Ballet. 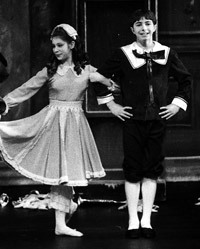 He played the role of Fritz in Westside Ballet’s 2000 production of The Nutcracker, and danced in the 2001 Spring Show. He continued his training at the School of American Ballet where he performed in numerous productions with New York City Ballet. From 2006 to 2008 Tanner danced with Pennsylvania Ballet II and performed in their productions of The Nutcracker, Giselle, Sleeping Beauty, Dracula, Lambarena, and Carnival of the Animals. Schwartz has attended summer programs at San Francisco Ballet and Miami City Ballet, both on full scholarship. In 2002 he was the recipient of the D.A.N.C.E. (Danish American National Cultural Exchange) Scholarship, dancing as an apprentice with the Royal Danish Ballet.